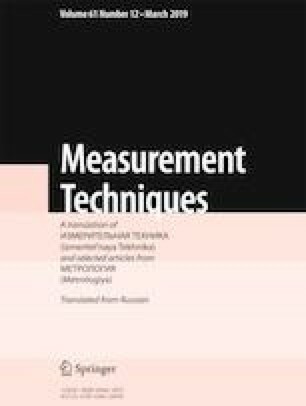 The need for a systems approach to the study of the robustness of techniques of performing measurements is evaluated. A model of losses of robustness of a measurement method by means of which the complete set of external and internal influencing factors may be identified is proposed based on a process model. Factors responsible for losses of robustness of the first and second kind are identified. Algorithms for identification and analysis of loss factors as well as control of these factors, including the application of Taguchi methods, are evaluated A conception of a complex technique of studying a measurement method on the stage of validation is proposed. Translated from Izmeritel’naya Tekhnika, No. 12, pp. 8–12, December, 2018. G. Taguchi, S. Chowdhury, and Y. Wu, Taguchi’s Quality Engineering Handbook (2004), http://downarchive.org/ebooks/9171.taguchis-quality-engineering-handbook.html, acc. 10.01.2018. Measurement System Analysis. Reference Manual, Daimler Crysler Corp., Ford Motor Co., General Motors Corp. (2002), http://rubymetrology.com/add_help_doc/MSA_Reference_Manual_4th_Edition.pdf, acc. 10.01.2018.